My wife hails from Jersey, in the Channel Islands, so we make regular trips there to catch up with family and friends. It also gives me a pretty good excuse, if I ever needed one, to take my camera and capture some of the stunning scenery on the island. La Rocco is a defensive tower from the Napoleonic era, and situated a half mile off St Ouen’s beach on the western end of the island. I’ve been to St Ouen’s on many occasions, but never yet managed a photographic outing through the combination of wrong tides, strong wind or just generally bad luck – plus La Corbiere lighthouse is a short distance from here, and usually draws me (as you will see from my other Jersey images!). Some time ago, a well-known pro landscape photographer told me you know when you’re a true landscaper when you obsess over four weather forecasts on an hourly basis. Well, on this particular day I was definitely a true landscaper! We had been in Jersey for a week and only had a couple of days left, and I hadn’t managed to make any images yet – I hadn’t even taken my camera out of its bag yet! Looking at the forecasts again, they suggested either light rain, heavy rain or a mix of light and heavy rain – with a chance of sunshine around 8pm. Now, for a relatively small island like Jersey, that’s quite some variance! However, Jersey airport was one of the forecast options, and was the one suggesting sunshine around 8pm. For those of you who are unfamiliar with Jersey’s geography, St Ouen’s is near the airport, and if you take off heading West, you’ll fly right over the beach and La Rocco tower. Airports like to have accurate forecasts for operational and safety reasons, so I was beginning to feel hopeful for a photographic opportunity. I’m quite partial to a passing storm front as they often give amazing light, and it looked like I might have one tonight. Despite the heavy rain and thunderstorms near St Helier, I packed my bag and jumped in the car to head off – I think my family thought I was mad! On arriving at St Ouen’s, I was beginning to doubt myself too!! The rain was even heavier, with a fairly brisk wind whipping in off the sea!!! Oh well, time to make the trip a little useful, so I decided to scout views, angles etc for a future trip, with hopefully better weather. After driving up and down 5 Mile Road (which is oddly 3 1/2 miles long), and checking out various chunky granite slipways on to the beach, I had narrowed it down to two potential shooting locations. The local authorities are currently renovating La Rocco, so a third possibility would be added to the list once the work is finished, and the scaffolding on the northern wall removed! It was still raining quite hard, so I left the slipway at Le Braye and headed south, considering heading home – but I had faith in the airport and their forecast, so I wasn’t driving very fast. I think the photography God heard my prayers, as just as I neared my preferred shooting location, a ball of light appeared between the clouds – at 8.05pm. They were late, but it looked like they might just be right after all. Diverting to the nearest car park, I pulled in, wound down the window, and turned off the engine. It was definitely doing something interesting, but was still raining quite hard. Oh well, I had a waterproof jacket on, and my camera bag has a waterproof covering, so I locked up the car and headed across the road to the beach. Heading down on to the sand via the impressive sea wall (think German WWII fortifications), I suddenly felt very alone. The wind was blowing, the rain was falling and I appeared to be the only person on the many square miles of beach. But, the light was improving and the rain easing – time to find some foreground interest! Just off to my right was some lovely chunks of Jersey granite, nicely leading down into a series of rock pools – looks like I had found my foreground. Having traveled light on this trip, I hadn’t taken my Manfrotto carbon tripod, and was about to initiate the 12″ tall Hama tripod I had bought earlier that day. I usually take my Manf, but just didn’t have the space or weight allowance this time. I could see several options that looked appealing. I wanted to show La Rocco tower in isolation – after all, it stands a half mile off-shore. As is usual, my best option looked like it would be from a small rock right in the middle of the biggest rock pool – they’re never near the edges! So, I checked the sky/land exposure difference and slipped the 0.9 Nd Grad into place. I also wanted to control the reflections in the pool, so added my circular polariser – I really didn’t want to be hunting for filters while balancing on an angled rock above water! I just couldn’t believe the transformation happening in front of me – the wind dropped, the clouds cleared, colours changed. I quickly adjusted the polariser to get the reflection effect I wanted, checked focus/aperture/ISO/Grad position and tripped the shutter. Voila, I was a very happy photographer. Rain was now getting quite close again, so I made my way back to sand, and started to head for the car park. All in all, the rain had stopped for less than 10 minutes, but I had captured possibly my favourite image of Jersey so far. I came away with two images I am very pleased with, and when I got back to my family, they couldn’t believe what I had captured as it was still raining heavily in St Helier, just a few miles from this view. If you’d like to see the brooding image I captured just before this one, take a look at my gallery pages. Sometimes you’ve just got to have faith, and persistence! Sunrise, best time of the day!! For the last eighteen months or so, I have been heavily involved in a major project for a company, so it’s been particularly pleasing to finally get out with my camera for some personal work. With a series of Landscape Photography Workshops kicking off this month, it was time to head out and double check potential venues. The last thing I need is to arrive at a venue, and find workmen rebuilding my foreground interest or blotting out the planned views! I was hoping to carry out these recce’s with some photography buddies as I’d not seen them for ages, but they were unable to make it through one thing and another, which left me on my own for this outing. It’s a shame I was all alone, but it really did strike home to me why I prefer sunrises over shooting at any other time of day!! Arriving at my parking space over an hour before sunrise, I quickly changed into my welly boots, pulled on my woolly hat and strapped my tripod on to my backpack – and was very glad I’d decided on full winter gear as it was -3 degreesC despite being in British Summertime! As my intended shoot venue features Sites Of Special Scientific Interest, the approach road is closed to traffic during nighttime hours to dissuade party goers and protect the wildlife. While this adds a mile or so to my walk, this gives extra time to take in the lovely clean atmosphere of pre-dawn times, and take a good look at the slowly brightening sky. Having checked my usual handful of weather forecasts the day before, I was expecting / hoping for a weather front to be passing over around sunrise. Despite the chances of getting rained on, passing weather fronts can give some very dramatic light. As I walked towards the beach, I could see clear skies above the peninsula I was heading for, irregular but heavy looking clouds above my head – but a bank of cloud on the horizon. As the sun was due to rise right through this distant bank, this could well and truly scupper any decent light as it would be completely blocked. Thankfully, as I arrived at the beach, the horizon was clearing, so my chances of a decent sunrise had increased significantly. Now, the question I get asked the most as a photographer popped into my head; why are most of my images sunrises and not sunsets? It’s days like this! Beautiful clean air, gently lapping waves, crisp clean sand and nobody around to get in shot or need excluding from a shot. It really is something special to be stood in such a beautiful location, knowing only you will see what transpires. I quickly set myself up mounting the camera on my tripod and fitted filter holder, cable release etc., and got ready for the sun to creep above the horizon. Just as it rose, I was rewarded with a few minutes of bright pinks and reds and made some images. However, while I captured some pleasing colours reflected in low surf, what really caught my attention was the gloriously warm light creeping up the beach to the distant beach huts. Having already checked out possibilities while waiting for the sun, I knew just where to head for, so decamped to the dunes. 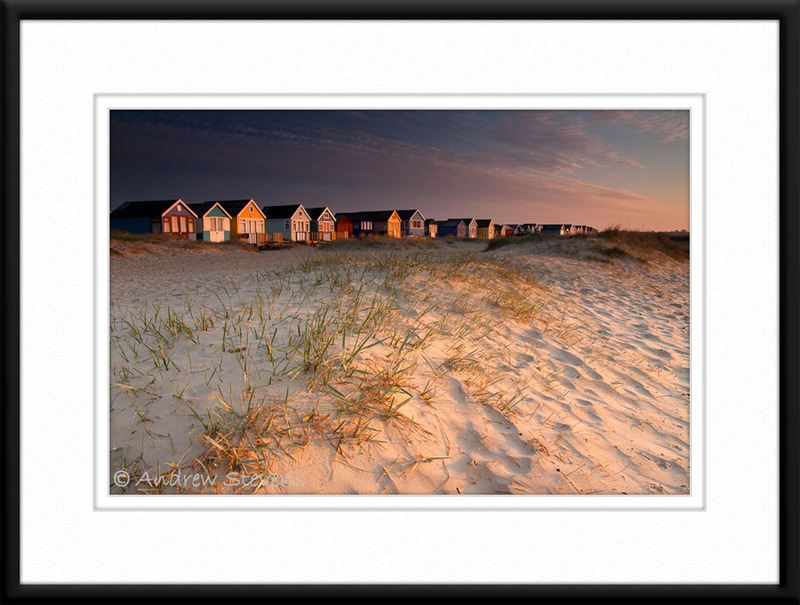 The light hitting the huts was strong and warm, so all I had to do was arrange my composition. Having found this low dune earlier, I used the grass to give foreground interest, define the location and act as a sense of scale for the distant huts. To exaggerate the lovely light more, and really highlight the huts / beach / grass, I opted for a 0.6 Neutral Density filter. This helped to darken the sky further, and make the beach and huts come alive with colour. I also used my Circular Polariser to saturate colours a little and control the bright reflections coming off the windows. Exposure info: 1/4sec at f/11, ISO100. Prints of this image are available from my website. Taken on the same evening as Pink Tide, this was a far safer capture as the ground was mostly dry! Arriving just after the tide had turned, the sea was fast approaching, and the causeway disappearing again for the night. The sky was sunny, but clear, so I didn’t really have a sky to work with, so needed to find some story to tell and a foreground for my image. I thought the causeway with rushing water would tell the story of the lighthouse being cut off at high tide, and wanted to show some of the danger that the lighthouse protects shipping from – big sharp rocks! As the only photographer onsite, I had my pick of the landscape in front of me. My wife is a Jersey girl, and she had accompanied me for the evening so we could take in the sunset together – something we’ve not done for a few years (since the arrival of our son! ), so we were very grateful to our relatives providing their babysitter service. Being a fairly straight structure, I used the causeway as a lead-in line, coming in from bottom-ish left, which is quite a classic composition, to guide your eye to the distant lighthouse. To properly tell my story about the rocks, I needed my foreground to be big, bold and bright. I originally tried placing the rock towards the bottom right, but that either put it partially out of frame, or small and insignificant within the frame, so I moved in closer to change the perspective, and exaggerate the scale. Having played with different exposure settings in some test images, 1/15 seconds gave me a suggestion of movement in the water around the rock, while retaining the shape of the rougher water over the causeway. I wanted to make the foreground rock really prominent in the image so, having calculated the sky/foreground exposure difference as fairly minimal, I decided to use a 2-stop (0.6) so the background sky had less immediate impact, while the rock glowed in the foreground. Now to time the shutter release to get the best movement/wave formation. I usually employ the Mirror Lockup function in order to minimise the chance of camera shake while tripping the shutter. This is great for static landscapes, but when you want waves in particular places, the extra 2 seconds delay proves prohibitive. All I needed now was to get a series of waves washing over the causeway as another washed around my rock. This proved entertaining to my watching wife. I was standing right where the surf was reaching, so almost getting wet feet. The waves around the rock came that little bit higher, so I was in risk of getting very wet feet and shoes (is the 7th wave really bigger?!). I was stood with one foot on the base rock, and the other on a larger rock, slightly raised up; as each bigger wave came in, I lifted my left foot, transferring to my right, so the wave washed underneath before planting it back down again to steady myself and lifting my right foot just in case it got wet – all without my eye leaving the viewfinder! After a few minutes, the tide was further in, the waves washed over with a bit more force, and I had my image! Exposure information: 1/15 sec at f/11, ISO100 with 0.6 ND Grad filter. Ok, this isn’t strictly a “Latest Image” as it was shot in August, but I’m rather behind with my processing after a very hectic summer, so this could be classed a “Latest Processed Image”! My in-laws live in Jersey, so we often visit the island as a family to catch up and take a break from things – well, that’s all things except photography! As well as the catching up with family and friends, chilling out on the beach, enjoying good food and wine, a trip to Jersey just wouldn’t be complete without a photographic outing or two. And if I only have time for one outing, it’s normally to La Corbiere, my favourite lighthouse. La Corbiere is joined to the island by a causeway, and is best visited during a rising tide so you get plenty of movement in the water, and rocks, sea, sky etc. Visit at low tide and you have a lighthouse and rocks; lots and lots of rocks. On this occasion, despite the glorious evening and sunshine, there was no cloud to speak of, so the foreground would need to be the more important part of the image (we photographers are never happy, are we?!?!). As the sun dipped, the sky colours started to warm up, so I started looking for rock shapes to guide us to the distant, and now cut off lighthouse. Moving away from the causeway, I found this gap in the rocks and thought it could work. The rocks were lining the edge of the frame quite nicely, the evening light was catching the rocks and the white water was forming patterns that could be used as foreground interest as well as a subtle lead-in to the lighthouse. Now, if you’ve ever stood in coarse sand (and this is sand from granite, so very coarse) with waves bashing your feet, you’ll appreciate this isn’t an entirely pleasant experience. The waves were strong, and I was now almost knee deep in water! Each incoming wave pushed me backwards, while each receding tide tried to take my tripod and camera with it! I was literally hanging on to the tripod to a) keep my equipment above the surface and b) to keep myself above the surface! I also had the problem of spray – lots of it! So, while trying to trip the shutter at the right time to get the effect I was after in the waves, I was also having to keep my equipment upright and constantly clean the filters with a cloth which hopefully wasn’t picking up sand! And with such a strong riptide rearranging the sand beneath my feet, I was having to recompose the image between each frame and wave – and all while checking my escape route wasn’t being cut off by the quickly incoming tide! This might look a nice serene image, but it was quite a physically demanding capture! Exposure information: 0.4 sec at f/11, ISO100, 0.9 (3-stop) Neutral Density Graduated Filter. Now, believe it or not, this was taken on a beautiful morning, when the sun had risen through the mist, giving me lovely reflections across the pond. But, this was an hour after sunrise, the sun was above the mist, and my morning was almost done. Being one to fully investigate each photographic opportunity, I walked around this pond surveying each angle for possible images. The lone oak tree in the distance is a personal favourite of mine, and has featured in many of my New Forest images. I love this tree and pond, but have never managed to successfully combine the two, as there is a thick swathe of trees normally viewable in the distance, which makes the oak tree merge into the background. But on this occasion the early morning mist was obscuring these trees – I spotted an opportunity! As is usual in these circumstances, to help me fully visualise the impact of B&W, I switched my camera into Mono mode. I always shoot in RAW format, so have to process the image file and make the B&W conversion later, but I always shoot in Mono mode so I can actually see the “finished” image instead of having to make best guesses (got to love digital photography for this!!). So, I had my foreground interest with the log, a nice mid-ground with smooth water, a distant lone tree and nothing really visible behind the tree – but it wasn’t working for me still. I moved position to place the curve of the pond near the top “third”, but really wanted to see all of the lone oak tree, which was partially obscured by the small bushes. Moving left a little cleared the tree from these nearby shrubs but moved the log out of position. At this point, I decided to employ a little “Cornish manoeuvre” (I would highly recommend Joe Cornish’s book “A Photographer At Work” as it highlights how he works, and how it’s sometimes ok to move things around to improve the prospective image). So, having moved the log a couple of feet, I now had my image lined up as I wanted, but it still didn’t quite work as I could see lots of weed etc in the pond. As I was stood at 90 degrees to the sun, I knew my polarising filter would have it’s strongest effect in such a position. Many photographers use polarisers to increase saturation and make clouds look pretty, but they are also very good at controlling reflections. On went the polariser, and I rotated the filter until I got the desired effect – the surface of the water became a virtual mirror. Now to replace the 0.6 (2-stop) Neutral Density Graduated filter needed to balance the exposure between foreground and background and I was ready. Focus checked, composition checked, ripples dissipated (only problem with realigning the log was the ripples caused) – time to press the shutter, and I had my image. Exposure information: 0.4 sec at f/11, ISO100 with 0.6 ND Grad and Circular Polariser filters. I’m very pleased to announce that I will be running another series of Photography Walks with Moors Valley Country Park in 2013. For those who haven’t been on one of these walks before, we spend an afternoon together, wandering around a local beauty spot, working on your photographic techniques to help you improve your landscape photography. All levels are catered for, as are all camera types, so don’t think a lack of experience or pro quality equipment will stop your fun. While I’m happy to talk the technicalities of photography, the majority of the time is spent on composition, seeing a photographic opportunity – and taking great images! This new series will start in the spring, once the weather has improved. Dates and venues will be announced soon, with places bookable through Moors Valley direct. Another image from my recent wanderings around the New Forest. It was quite breathtaking watching the early morning sun creep over the horizon to light up the trees I was stood in front, and photographed here. And I still chuckle to myself as I remember the other photographers who were darting around looking for an instant image – all they had to do was look around them, chill out, and watch the light start to do its work. As the full sun hit the trees and foliage, it really came alive and took on a 3D effect. I did get a few odd looks from passing drivers and cyclists too. It was a glorious morning, and I was stood in the middle of a forestry clearing, looking very much like I wasn’t doing anything. But, I was shooting the trees across the road from me, with my 70-200mm lens, so they were probably trying to figure out what I was up to – if they’d looked where I was looking instead of at me, they would have seen this wonderful sight! This next “In Focus” covers an image captured over a period of a few weeks, with some serious detective work involved. Now, I can’t take the credit for the detective work, and have to take my hat off to my photography buddy, Mike. This field of poppies is viewable from quite a distance, but the part that’s not easily visible is the access! Well, not to be put off, Mike got in touch with the local council, who put him in touch with the county councils, who gave him the number for… Many phone calls and emails later, Mike had the contact number for the manager of the farm that this field forms a part of. To explain a little about UK farming… Certain pesticides used to be used to eradicate weeds etc from crop fields. In our ever-increasing desire for “cleaner” foods, pesticides are used less and less as are the chemical delivery methods. Think back to the last time you saw an airborne crop sprayer? These days, you often see early flowering wild plants, such as poppies, growing among later harvesting crops such as barley and wheat. Now, a poppy, despite it’s beautiful shape and colour, is often viewed as a weed by a farmer – and our farmer was fairly new in his job, and was uncertain of letting us advertise his “field of weeds”. We struck the agreement that he would grant us access to his field, as long as we didn’t advertise the farm it was part of or giveaway the location – now that’s a deal I can shake on!! So, we have permission – but how do we get in? That turned out to be via a gated entrance that gets locked without warning, and then scrambling up a virtually sheer mud bank to then fight our way through a hedge. This wasn’t easily done, especially with a fully loaded camera bag and tripod on your back. Now all we needed was some decent weather, and preferably before the poppies started to turn for the worse. After the usual checking of various weather forecasts, a date was set and we headed off. Having safely made it into the field, we stopped to take in the view. This wasn’t any artistic viewing, or consideration of compositions, this was just a “wow” moment when we saw the field of poppies before us! We experimented with various compositions, and waited for the sunset. Nothing happened, no interesting sky, no colour, no nothing, just a few clouds… We had some pleasing images but felt a little disappointed, so we packed up and headed back to the cars vowing to return. This is when we discovered that clambering up a virtually sheer mud bank was a breeze compared to scrambling down the same bank, in the dark!! We agreed to return, so decided to keep all eyes on all weather forecasts and reconvene soon – very soon! Finally, we saw a window of opportunity and made plans. On arrival, the sky looked better, much better! The mud bank was almost skipped up in anticipation as we headed into the field. Having tried various landscape compositions (as in with the camera in landscape orientation, or horizontal), I switched to portrait aspect, or vertical. It seems that as my style develops, I shoot more and more in portrait mode – I don’t know why, I just find vertical aspect images more pleasing at the moment. I had this image in my head of the setting sun highlighting the colour of the poppies, but I needed a few more elements to make the image work. These extra elements also needed to be subtle, to keep the viewer focused (pun intended) on the poppies and sunset. After some time scrabbling around on my knees, I saw my extra elements – barley heads, mixed in with the poppies, and pointing up towards the setting sun. Not only were these subtle, they also acted as lead-in lines to draw the viewer up from the poppies to the setting sun. Having removed all the filters, I reattached the 0.9 (3-stop) Graduated filter, which nicely balanced the top of the sky. By adding any further Grads, I was darkening the top of the sky too much, but not darkening the horizon at all due to the clear part of the filter. So, I took my 0.3 (1-stop) Graduated filter, turned it upside down, and slid this in so that the clear part was at the top of the frame, and the darkest section was positioned on the horizon. When doing this, filter positioning is critical as an inverted filter wrongly positioned by just a few millimeters can have disastrous effects on the resulting image, casting thick dark lines in the wrong place. I could see in the viewfinder exactly the image I had mentally pictured; glowing poppies, colourful sky, subtle lead-ins. Having rechecked focusing, aperture selection, filter placement, sun position, cloud position, frame edges (always check the edges for unwanted distractions! ), I realised I was holding my breath! Something I often do when I know I’ve got a good image waiting to be captured!! A gentle squeeze on the cable release, the timer delay seems an eternity, the mirror swings up, more delay, the shutter opens, one second passes, the shutter closes and up pops an image on the LCD – and out slips a “woo hoo” from the photographer (I shan’t mention the comment made by Mike when he saw the LCD, it’s unrepeatable on here!!). When working on the computer, I often look at my images several times before processing them, as I tend to be fairy brutal with the delete button and only retain real “keepers” (I’ve never understood why some photographers keep bad images; Photoshop CS27 isn’t going to make it good!). This was one of those rare occasions when I processed this image that same evening, and uploaded it to Alamy the image library, and sent out emails to local magazines. I’m glad I did, as Dorset magazine took it straight away, and it featured on the front cover of the very next issue!! Taken on the same day as, and within a short walk from, Autumn Frost, this is a venue I’d had my eye on for some time! As a keen cyclist, I often venture out for a two-wheeled blast – and this driveway is on my regular route! I’ve been watching these trees change from bare wintery wood, to spring green, to thick summer canopy – but it was autumn and golden colour I was waiting for. Not only do I enjoy the warm tones of autumn, and the driveway may look resplendent all year round, but the early morning light doesn’t make the most of the trees until autumn time when the lower angle of light gives an almost 3D effect. Normally, landscapes are taken on wide-angle lenses, to capture the wide vista in front of the camera. However, some occassions call for a longer lens, and the perspective flattening effect that comes with it. Using my 70-200mm lens, I composed the shot so the trees formed a canopy, and framed the distant gateway. Normally, a strong element of foreground interest is included to give scale and perspective, but you don’t get many strong elements in the middle of a driveway! However, with low angle light coming through the trees from my right, it was just a case of waiting for the sun to reappear from behind a cloud and cast raking shadows across my foreground. Exposure information: 1/4 sec at f/11, ISO100. So, having said in my last “In Focus” that I prefer shooting fresh new views, here’s a tale about an oft photographed but iconic landscape! Kimmeridge is a fairly small bay that forms part of Dorset’s Jurassic Coast. That may not sound much of an iconic venue, but when you add in a land owner’s folly tower, “nodding donkey” oil wells, fossils, dinosaur footprints, WWII defences and rugged rocky shoreline, it starts to sound more interesting. If you Google “Kimmeridge”, and check the “Images” tab, you’ll see many versions of Clavell’s Tower, rocky ledges and the subject of this image – Clavell’s Pier. Clavell was a local landowner, living on the nearby Smedmore Estate, which includes Kimmeridge. The “pier” is a natural rock formation that sits next to the small harbour in the bay. The pier is only really visible from the seaward side, and at low tide, so strong footwear is recommended if you fancy visiting this local landmark. And if you’re thinking of visiting, keep an eye on the time as the gates are locked at 10pm, sharp! The pier points West, so the best time to shoot is evening and sunset. Having been keeping my usual eye on multiple weather forecasts, a Monday evening was chosen to head out. On arrival, I spent the early part of the evening on the rock ledges to be found on the main shoreline of the bay, trying different compositions and angles. Then, as the sun started to lower, I headed around to the pier. The advantage of shooting iconic landscapes on a weekday, is the lack of other photographers jostling for space – you can get queues waiting sometimes for “that view”, which is another reason why I prefer fresh locations; I had the place to myself except for a couple of fishermen and surfers. Subjects like Clavell’s Pier actually help you with your composition. As you will have seen if you’ve Googled the place, you only ever see images made from the seaward, or left hand side. Once onsite, it’s easy to see why as there really isn’t a view to be had from the right hand side. To get my Mono image, I needed to add extra textural elements. To do this, I needed smooth water, rough rocks and plenty of texture in the sky – a long exposure would provide these for me! As well as smoothing the sea, a longer exposure would also allow several waves to wash over the rocks while remaining unrecorded, which leaves a lovely glossy look. I had already calculated a 0.9 (3-Stop) Neutral Density Graduated filter would be required to balance the exposure of sky, sea and rocks and it was now a question of guesstimating the travelling speed of the clouds, and selecting the right shutter speed to give the desired amount of sea blur and sky streak. After some experimentation, I had to switch to Manual mode from my usual Av (Aperture Priority) mode. Due to my camera’s programming, the longest shutter speed I could get in Av mode was 30 seconds; while this was blurring the sea nicely, I wasn’t getting enough movement in the clouds. The 30 second exposure had been at f/16, so by using the Bulb function in Manual (which basically lets you keep the shutter open as long as you like), I could select a 1-stop smaller aperture of f/22 and use the corresponding doubling effect to give me a 1 minute exposure – bingo! I had my image!! Exposure information 60 secs at f/22, ISO100 with 0.9 ND Grad filter.